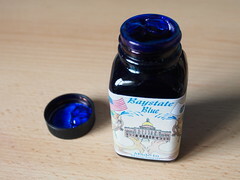 Noodler’s inks are not easily available from retailers in the UK. 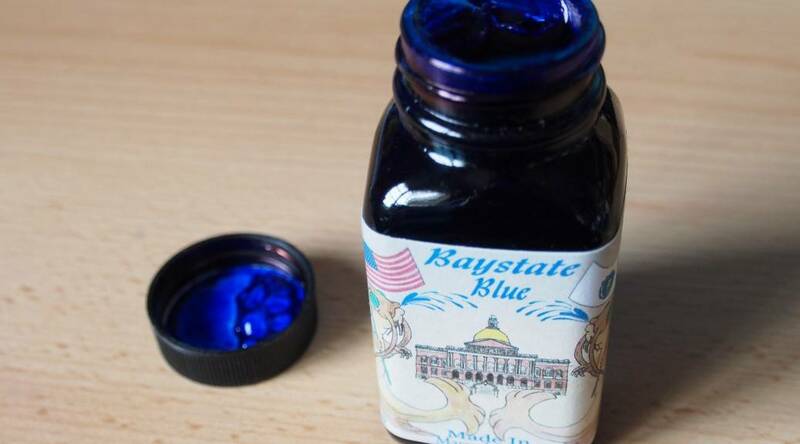 There is only one supplier I know of over here (Pure Pens) but the stock is very limited and doesn’t currently include Baystate Blue. This particular 3oz bottle was bought from Ebay. The shipping costs make price comparisons difficult so I won’t attempt to do so on this occasion. The box is white with standard line drawing. The bottle is simple and functional, filled almost to the brim. The label is attractive, although I can’t claim to be aware of the historical background. The ink itself has a strong smell. I don’t find it unpleasant, but I could understand why some would. So many US inks seem to have strong smells, compared to Europeans and Japanese inks. It’s usually difficult to pin down exactly what the smell is. Often the most I can say is (as in this case) that it reminds me of something I would ave come across in a chemistry lesson may years ago, but I can’t way exactly what. The one word I can think of is “Phenol” – but that’s probably my memory playing tricks. 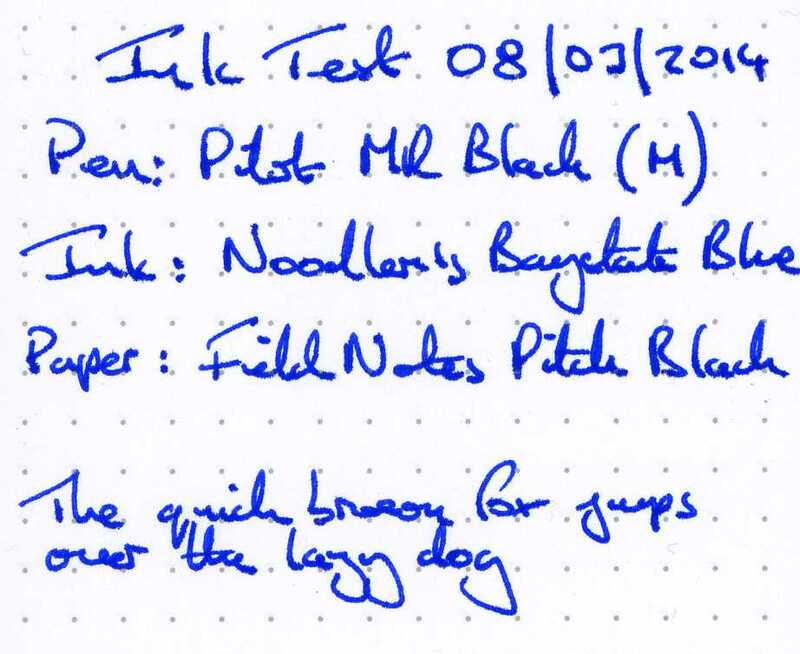 For the purposes of this test I inked up a Pilot MR (similar to a Pilot Metropolitan) with a medium nib. The flow was very good on this paper, although there were some hard starts. 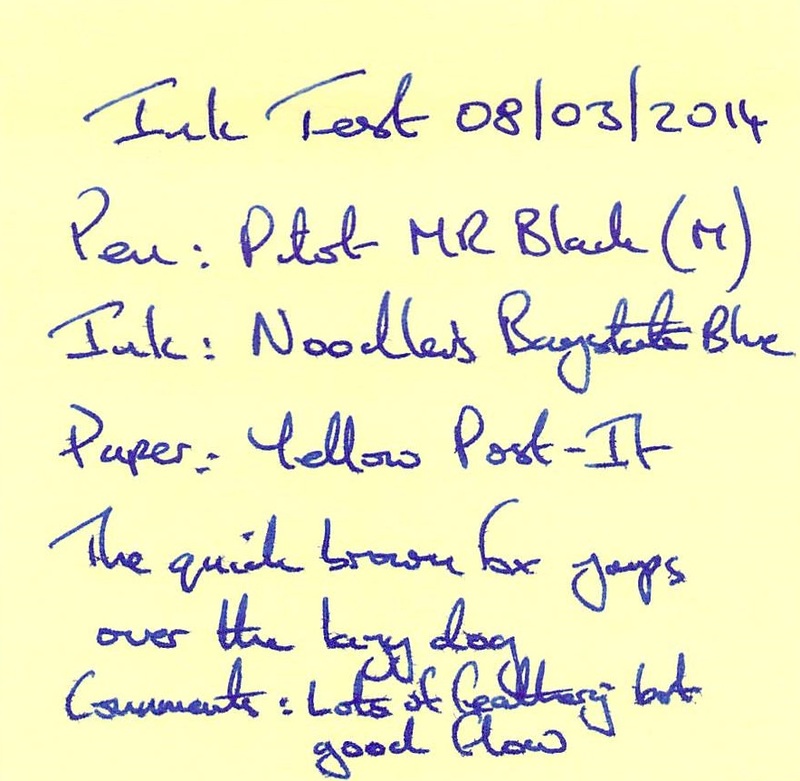 Not a great surprise for a saturated ink with a smooth nib on this paper though. I noted some feathering and bleed through. 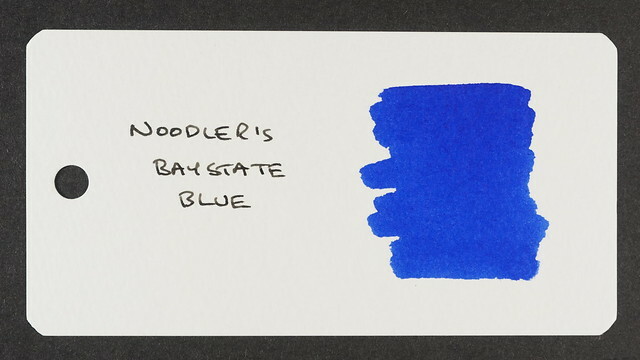 The colour trumps everything though – it pops off the page and is pretty much everything I could want from a blue ink – striking with a faint hint of violet. Note to self: take more care with the layout in future. I noticed after scanning that I had written 3″ x 3″ – oops. 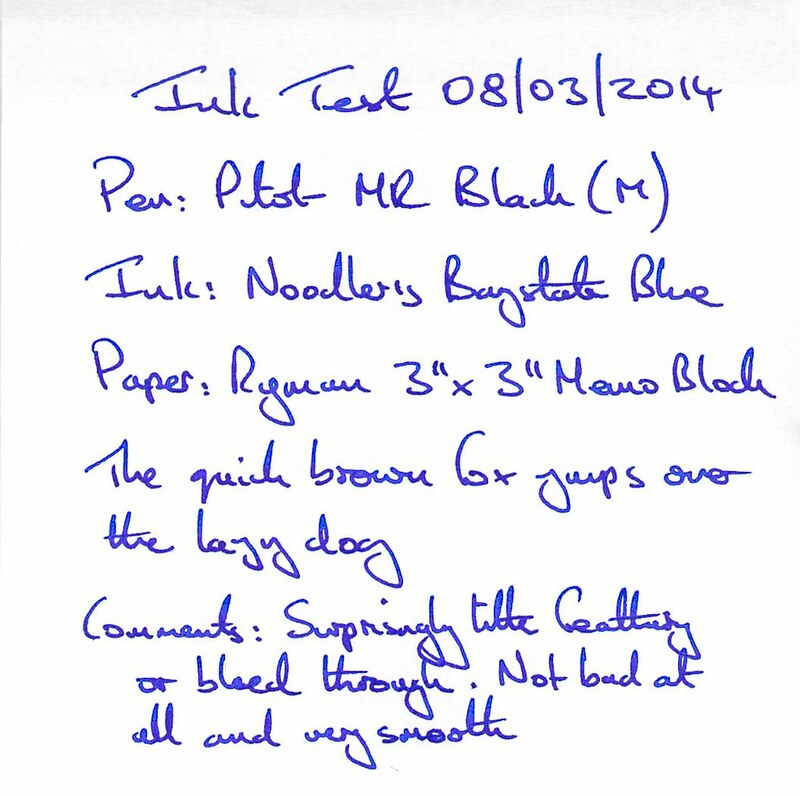 Very smooth writing experience and surprisingly little feathering or bleed through. Looks good. Skips where the adhesive is (but I’ve seen worse) and feathers a lot. A great contrast with the yellow paper. Feathers, bleeds and spreads badly. 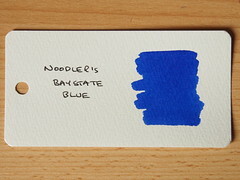 In the unlikely even that I use a fountain pen in a Field Notes book, it won’t be with this ink. Update 22/03/2014: Word card now added. Not much to say other than the texture detracts slightly and makes the ink look less saturated. Overall I think the scans give a fairly accurate impression of the colour, which is what makes this one a keeper. It will stay for the time being in my “Lounge Note-Taker”. 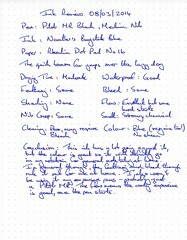 I wouldn’t use it an expensive pen or even a modestly priced demonstrator, but I’m happy to put it in a Pilot MR which is easy to clean. Fountain pens are all about choice, and that’s mine. I will leave it to others to make their own minds up. I won’t make a habit of linking to loads of other reviews, but I’ll end this one with Nathan Tardiff’s own videos. 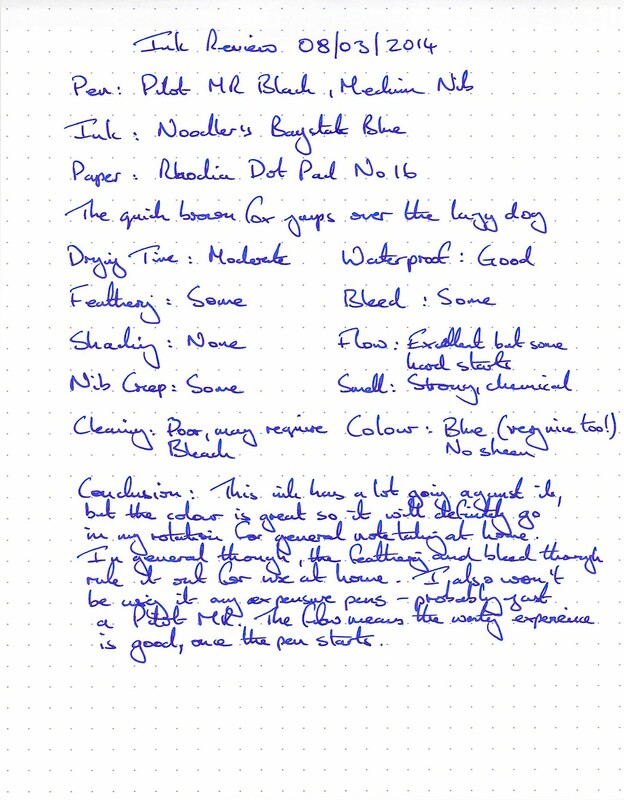 I’ve been using this ink in a Pilot Kakuno M nib with a 70 % ink and 30 % distilled water with awesome results, one of my favourite FP – ink combos.